MERIDIAN, IDAHO — Jaxon, an 11-year-old pug, was the first in his home to notice sparks coming from at outlet inside their home. He took action the best he could and the family’s happy he did. The praise – which was well deserved, after he saved his family from a fire – that could have destroyed their home. Mikaela Sebree says her dog saved their family from a fire that could have destroyed their home. It was Jaxon’s bark that told them something was wrong. “Dogs have different kinds of barks, so he has his ‘somebody’s at the door’ bark and then he has his ‘holy crap something’s happening’ bark,” Sebree said. Sebree’s husband rushed down stairs to find sparks quickly turning into flames on an outlet. After knocking the flames down with a fire extinguisher, Meridian Fire Department arrived. They say this canine prevented a lot of destruction. “Certainly his actions and the actions of this dog saved that house from potentially igniting and catching on fire and going up into walls and up into the attic and caused significant damage,” said Meridian Fire chief Mark Neimeyer. Now this four-legged family member is Meridian’s first animal to receive the Hometown Hero Award. “I’ve never seen anything quite like this in Meridian,” Neimeyer said. He’s also earned an official probationary firefighter badge, giving “Sparky the Fire Dog” a run for his money. 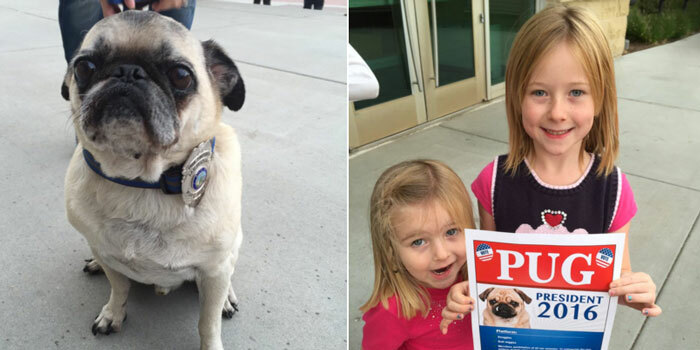 “Jaxon is definitely a super pug, he deserves the hometown hero. He saved our house, he saved our lives and he saved our memories,” said Todd Lavoie, the other owner of Jaxon. Meridian’s Fire chief wants to remind the public that not everyone has a pug named Jaxon, so it’s always a good idea to check the batteries in your smoke alarms.